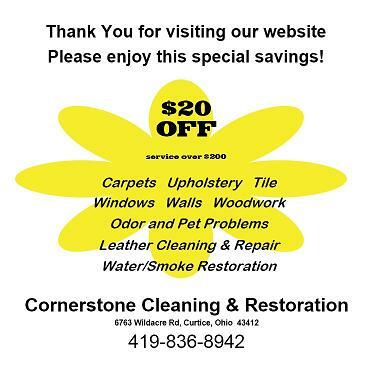 Cornerstone Cleaning & Restoration, LLC, features the "Restoration Method" of carpet cleaning recommended by the Carpet and Rug Institute, for the best removal of ground-in dirt and soil. By using our powerful truck mounted, hot-water extraction equiptment and patented RX-20 Rotary agitation cleaning tool, we can restore your carpets to a clean and sanitized condition. We spared no cost to provide you with a clean and healthy environment. When our IICRC Certified Technician arrives, he will pre-spray, which breaks up the heavy soil in traffic areas as well as any spots there may be. We use only formulas that are safe for you and your pets. Our powerful truck mount heats the water to 220 degrees. We carry our own water and have a water softener on board our truck to rinse your carpets. This ensures the removal of dirt, dust mites, pet danger and other allergens. We never leave residue in your carpet. We will take care to move all moveable furniture to clean and replace it, placing protective pads and blocks to protect the carpet as it dries. The RX-20 Rotary Jet Extractor is the best agitation and extraction producing better overall results. The self-powered RX-20 consistently cleans all areas of the carpet, as operator's physical strength is not important. It applies the power of five men simultaneously cleaning, returning carpet fibers to a like-new fluffy condition. Carpets will dry fast too! We will then rake the carpet fibers to help set the nap, leaving a finished look. We suggest applying 3M Scotchgard to protect the carpet fibers. Your carpets will repel soil and spills. Your carpets will stay nice longer. Cornerstone Cleaning & Restoration, LLC is capable of cleaning virtually any fabric including Haitian cotton, cotton velvets, and more. Understanding the construction and fiber type of your upholstered furniture is an essential part of safe and effective cleaning. Our IICRC Certified technicians are trained in the best cleaning methods for your fine fabrics including "WET" or"DRY CLEANING." We can also remove undesirable odors from your upholstered furniture. Unforeseen spills and accidents can be quickly scheduled to minimize damage to carpets. Immediate action is often the best action.